Helping Your Child to Want to Take That Shower! If you have a child in late elementary or middle school, you may relate to that phase when hormones, and body odors specifically, begin to increase, but the desire to take care of personal hygiene decreases. Every suggestion (or command) to get in the shower is perceived as a controlling insult. Hygiene in general, and showering in particular, can cause resentment and frustration in families as kids desire more independence. Numerous parents have told us they have struggled with this conflict. Kids are no longer small enough to swoop up from the pile of toys and plop into the tub. Recently Katrina (one of our coaching clients) decided to build wisdom instead of trying to manage behavior when it came to hygiene at her house. Showering had been a dicey issue in our house. Either her dad or I would announce, “Tonight is a shower night!” She’d proclaim, “Nooo! I’m not showering,” and the power struggle would escalate. I decided to approach this more as a coach, building wisdom, than as the “shower sargent.” We started our discussion by watching an educational video. There were some moans and groans during the video, especially when it mentioned bacteria on your skin and the benefit of showering daily. M: How are you feeling about your hygiene, especially about showering? M: What are your thoughts on what the video said? C: I don’t want to shower every day! M: How often do you think you should shower? M: Ok. (staying relaxed and curious) What would be the pluses and minuses to showering once a year? C: You’re just asking me because you want me to shower every day! M: No. It’s not about what I want. It’s about you caring for your body. I’m just curious what your thoughts are. So, if you want to shower once a year what would be the pluses and minuses to that? M: Ok. What are the minuses? C: I’d stink. I might get sick more often. My skin would start to itch. M: It sounds like there is one positive to showering once a year: you only have to take the time to do it once a year. At the same time it sound like there are quite a few minuses. What are some other options for showering? C: Once a month! But I would still be stinky. M: What else could you do? M: What would be some pluses and minuses to that plan? M: Ok. So an option they said in the video was every day. What do you think about that option? C: I DON’T WANT TO SHOWER EVERY DAY!!!! M: I can tell you have some pretty strong feelings about showering. What is it that makes you feel so upset about showering? C: You just want me to shower every day! M: No. I honestly want to understand what it is about showering that you don’t like. Shower in mom and dad’s bathroom. Shower when he’s not home. Bring clothes into the bathroom so that she doesn’t have to walk out of the bathroom with just a towel. M: Which of these ideas about how often to shower seems like the best option? C: I’ve decided I want to shower every other day. Since I wear deodorant, and it’s cold weather now, I won’t be stinky . M: Do you want my help in remembering shower days? C: It’s ok to remind me if it’s a shower day and it’s after dinner and I haven’t done it yet. Help your kids identify their choices, and then evaluate the pros and cons: What would be good about that? What might not be good about that? You are Safe with me and I will respect your need for independence. You are Called and Capable of making wise choices. You are Responsible to take care of your body well. There are certainly issues where parents should set boundaries and be firm about consequences. 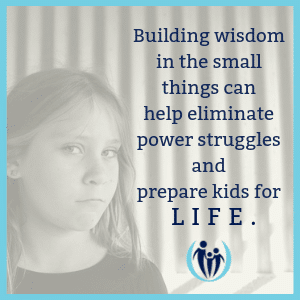 But building wisdom in the small things can help eliminate power struggles now and prepare kids for a lifetime of thoughtful, wise choices when the stakes are higher. And even when boundaries are necessary, kids learn and cooperate so much more when you ask curious, helpful questions, seek understanding, and problem-solve obstacles. And when your kids show that glimmer of wisdom – encourage and affirm them! keep a clear head—you’ll find a good life. 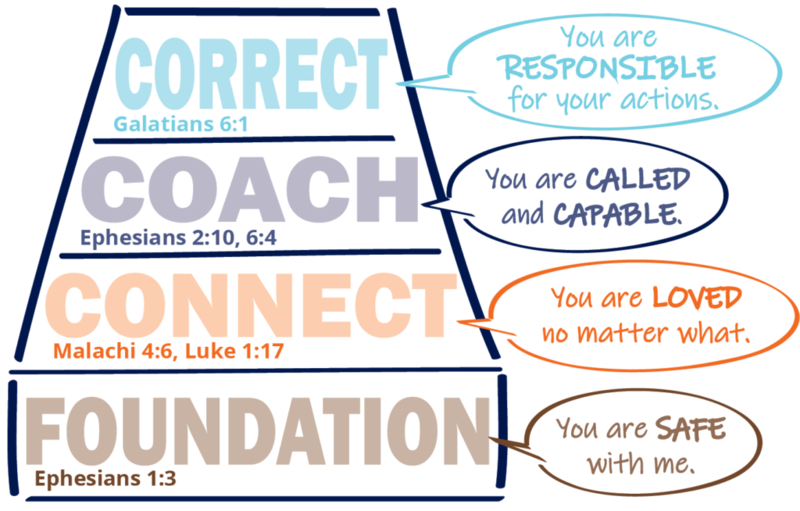 When engaging in discipline situations it’s easy to get caught up in, “Because I said so!” but often times a thoughtful discussion about the “why” behind the instructions you are giving can make all the difference. Your child wants to know you are for her! ← What is the goal of your discipline?